Small bitter gourds are salted and slightly cooked. They are then stuffed with onion and masala mixture. 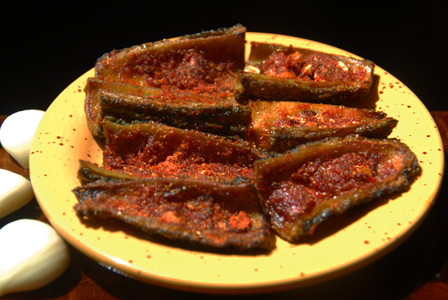 Stuffed bitter gourds are then fried in little bit of oil till golden brown. Serve masala stuffed bitter gourd with plain steamed rice and with dal rice and ghee. Makes: 3 Masala Stuffed Bitter Gourd. Soak tamarind in few tablespoons of water. Remove ends, lightly scrape and wash the bitter gourds. Slit the bitter gourd in the middle making sure the ends are intact. Remove seeds and apply few pinches of salt inside and outside. Leave the salted bitter gourds aside for around half an hour. Wash the bitter gourds and pressure cook with tamarind water for a whistle. Strain the cooked bitter gourds and keep aside. Heat a tablespoon oil in a pan, add chopped onion. Fry till onion turns translucent and add ginger garlic paste. Fry briefly and remove onto a bowl. Add garam masala powder, red chili powder, cumin powder, turmeric powder and salt to the onion in the bowl. Mix thoroughly and stuff around few tablespoons of onion mixture into each bitter gourd. Heat a tablespoon of oil in a pan on medium low heat, place the stuffed bitter gourds. Fry the stuffed bitter gourd till they turn golden brown on all sides. Serve masala stuffed bitter gourd with plain steamed rice and with dal rice and ghee. Notes: Make sure bitter gourds are fried well. Suggestions: Prefer small bitter gourds to ease the stuffing or halve the whole bitter gourd. Leave couple of seeds inside the bitter gourd if desired. Alternatively, steam the salted bitter gourds until they turn soft but whole. Variations: Check other stuffed bitter gourd recipes here. Other Names: Masala Stuffed Bitter Gourd. Peanuts are roasted and are coarsely ground with spices and toasted sesame seeds. The freshly prepared spice powder is stuffed inside the bitter gourds and cooked on low heat till soft inside and crisp outside. 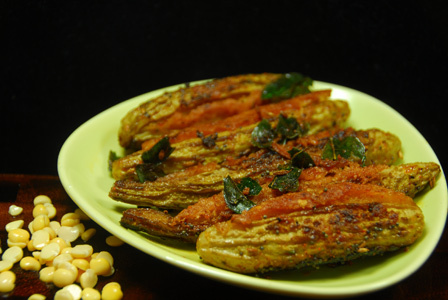 Serve peanuts stuffed bitter gourd with plain steamed rice. Makes: 6 Chana Dal Stuffed Bitter Gourds. Wash and soak chana dal in enough water for around 2 hours. Soak the whole red chiles in warm water for couple of mintues. Lightly scrape, wash, remove ends and make a vertical slit in the stomach of bitter gourd keeping its ends intact. Remove the seeds to hollow the bitter gourds and reserve them. Grind the soaked chana dal, fennel seeds, cumin seeds, red chiles, reserved bitter gourd seeds and salt into coarse mixture with adding just enough water. Stuff each bitter gourd with few tablespoons of prepared chana dal mixture and keep aside. Heat a tbsp of oil in a nonstick pan on medium low heat, arrange the stuffed bitter gourds in the pan. Cook covered on low flame for bitter gourds to soften and starts to turn golden brown (around 8 minutes). Uncover, make sure to carefully turn the bitter gourd to uncooked side and cook covered for few more minutes. Uncover and turn the bitter gourds on the uncooked sides and fry till they are completely cooked and starts to turn dark brown. In the middle of the pan, add few drops of oil, add mustard seeds, cumin seeds and curry leaves. Fry till mustard seeds start spluttering, add turmeric powder and stir. Remove from heat, add red chili powder and a pinch or two of salt. Serve chana dal stuffed bitter gourd with plain steamed rice. Notes: Choose small thin bitter gourds which aid in proper stuffing and frying. Variations: To reduce the bitterness, apply a tsp of salt all over and inside the bitter gourd. Leave aside for an hour or two and wash under running water before stuffing them with chana dal. Other Names: Chana Dal Stuffed Bitter Gourds. Bitter gourd is lightly scraped and chopped and can be boiled till soft or fried till cooked. Besan yogurt mixture is cooked in tempered oil along with cooked bitter gourd till the raw smell of the besan is gone.Served bitter gourd kadhi with steamed rice and dollop of ghee. Makes: around 4 Servings of Bitter Gourd Kadhi. Whisk together yogurt, besan, turmeric powder and salt into smooth mixture with a cup of water. Lightly scrape, remove ends, wash and chop bitter gourd into small chunks. 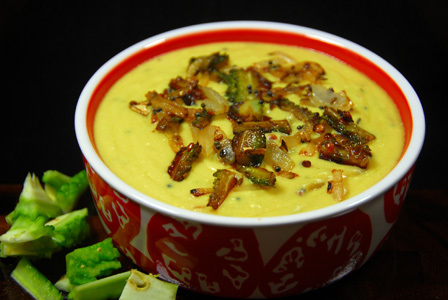 When urad dal changes color, add bitter gourd pieces and fry on low flame till bitter gourd turns golden brown in color. Stir in onion and green chiles and fry again till onion turns translucent. Reserve a spoonful of above mixture for garnish. Then lower the flame, stir in besan yogurt mixture. Cook on low flame stirring continuously until raw smell of the besan is gone (around 5 minutes). If the mixture thickens a lot, add quarter cup of water and bring again to a bubble. Garnish with reserved bitter gourd mixture and serve bitter gourd kadhi with plain steamed rice and dollop of ghee. Notes: Make sure to cook the besan yogurt mixture well. Suggestions: Alternatively, bring around a cup of water to boil, add bitter gourd and salt. Boil till bitter gourd pieces cook and turn translucent before adding to the besan mixture. Adjust the consistency of the kadhi with water. Variations: You can also garnish with chopped cilantro if you wish. Other Names: Kakarakaya Challa Majjiga, Bitter Gourd Kadhi. Bitter gourd and potato are chopped into small pieces and fried in oil till cooked. The bitter gourd potato fry is finished with spice powders. Serve bitter gourd potato fry with steamed rice and dollop of ghee or with roti. Makes: around 2 Servings of Bitter Gourd Potato Fry. Lightly scrape, wash, remove ends and chop bitter gourd into small pieces. Peel, wash and chop potato into small pieces. Grind dalia into fine powder and keep aside. Heat oil in a pan, add cumin seeds and chopped bitter gourd. Fry for few minutes, add the chopped potato. Fry till bitter gourd changes color and is cooked and potato turns golden brown. Add chopped green chiles in the middle of the pan and fry for half a minute and mix with the fry. Stir in coriander powder, turmeric powder, dalia powder and salt. 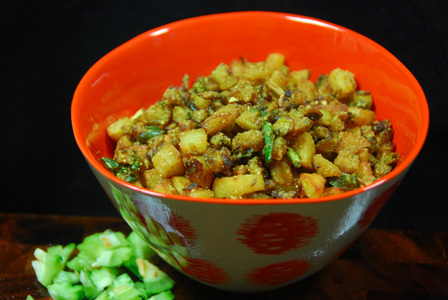 Remove from heat and serve bitter gourd potato fry with steamed rice or with roti. Notes: Make sure bitter gourd and potato are cooked well. Variations: You ca also add red chili powder for extra spice. Other Names: Bitter Gourd Potato Fry, Kakarakaya Bangala Dumpa Vepudu.